[[p. 130]] An important problem in Natural History, and one that has hitherto been too little agitated, is that of ascertaining the most natural primary divisions of the earth's surface, taking the amount of similarity or dissimilarity of organized life solely as our guide. It is a well-known and universally acknowledged fact that we can choose two portions of the globe of which the respective Faunæ and Floræ shall be so different, that we should not be far wrong in supposing them to have been the result of distinct creations. Assuming then that there are, or may be, more areas of creation than one, the question naturally arises, how many of them are there, and what are their respective extents and boundaries, or in other words, what are the most natural primary ontological divisions of the earth's surface? In the Physical Atlases lately published, which have deservedly attracted no small share of attention on the part of the public, too little regard appears to have been paid to the fact that the divisions of the earth's surface usually employed are not always those [[p. 131]] which are most natural when their respective Faunæ and Floræ are taken into consideration. The world is mapped out into so many portions, according to latitude and longitude, and an attempt is made to give the principal distinguishing characteristics of the Fauna and Flora of each of these divisions; but little or no attention is given to the fact that two or more of these geographical divisions may have much closer relations to each other than to any third, and, due regard being paid to the general aspect of their Zoology and Botany, only form one natural province or kingdom (as it may perhaps be termed), equivalent in value to that third. Thus in 'Johnston's Physical Atlas,' the earth is separated into sixteen provinces for Ornithology, solely according to latitude and longitude, and not after ascertainment of the amount of difference of ornithic life in the respective divisions. Six of these provinces are appropriated to America, one to Europe, and six to Asia, Australia, and the islands; a very erroneous division, according to my ideas, as I shall hereafter attempt to show. In Mr. Swainson's article in Murray's 'Encyclopedia of Geography,' and in Agassiz's introduction to Nott and Gliddon's 'Types of Mankind,' what I consider to be a much more philosophical view of this subject is taken. The latter author, in particular, attempts to show that the principal divisions of the earth's surface, taking zoology for our guide, correspond in number and extent with the areas occupied by what Messrs. Nott and Gliddon consider to be the principal varieties of mankind. The argument to be deduced from this theory, if it could be satisfactorily established, would of course be very adverse to the idea of the original unity of the human race, which is still strongly supported by many Ethnologists in this country. But I suppose few philosophical zoologists, who have paid attention to the general laws of the distribution of organic life, would now-a-days deny that, as a general rule, every species of animal must have been created within and over the geographic area which it now occupies. Such being the case, if it can be shown that the areas occupied by the primary varieties of mankind correspond with the primary zoological provinces of the globe, it would be an inevitable deduction, that these varieties of Man had their origin in the different parts of the world where they are now found, and the awkward necessity of supposing the introduction of the red man into America by Behring's Straits, and of colonizing Polynesia by stray pairs of Malays floating over the water like cocoa-nuts, and all similar hypotheses, would be avoided. But the fact is, we require a far more extended knowledge [[p. 132]] of zoology and botany than we as yet possess, before it can be told with certainty what are the primary ontological divisions of the globe. We want far more correct information concerning the families, genera, and species of created beings--their exact localities, and the geographical areas over which they extend--before very satisfactory conclusions can be arrived at on this point. In fact, not only families, genera, and species, but even local varieties must be fully worked out in order to accomplish the perfect solution of the problem. There is no reason, however, why attempts should not be made to solve the question, even from our present imperfect data, and I think the most likely way to make good progress in this direction, is for each inquirer to take up the subject with which he is best acquainted, and to work out what he conceives to be the most natural divisions of the earth's surface from that alone. Such being done, we shall see how far the results correspond, and on combining the whole, may possibly arrive at a correct solution of the problem--to find the primary ontological divisions of the earth's surface. With these views, taking only the second group of the Order Vertebrata, the Class Aves, I shall attempt to point out what I consider to be the most natural division of the earth's surface into primary kingdoms or provinces, looking only to the geographical distribution of the families, genera, and species of this class of beings. Birds, being of all the animated creation the class most particularly adapted for wide and rapid locomotion, would, at first sight, seem to be by no means a favourable part of Nature's subjects for the solution of such a problem. But, in fact, we know that there are many species, genera, and even families of this class, particularly amongst the Passeres, whose distribution is extremely local. The Nestor productus, confined to the little island called Philip Island; the several genera of Finches peculiar to the archipelago of the Galapagos; the gorgeous family Paradiseidæ, restricted to the Papuan territory, are familiar examples of this fact. Again, the migratory birds which traverse large districts of the earth's surface, how constant are they in returning only where they have been in former years! We do not find that the Nightingale extends its range farther to the west one year than another, nor that birds looked upon as occasional visitors to this country, grow more or less frequent. If the contrary be the case, it may always be accounted for by some external cause, generally referable to the agency of man, and not to any change in [[p. 133]] Nature's unvarying laws of distribution. It is, however, amongst the Passeres that we find endemism most normal; the Accipitres, Anseres, and, more than all, the Grallæ are ever disposed to be sporadic, and indeed some species belonging to the latter order may be denominated truly cosmopolitan. Taking then the birds of the order Passeres (which I consider ought properly to include the Scansores or Zygodactyli) as the chief materials from which to derive our deductions, let us suppose a species of this group, but of doubtful form and obscure plumage, to be placed before the Ornithologist, from whom its name is required. The first thing he looks to is, whether it is from the Old World or the New; and this is a point which, as a general rule, a mere glance at the external appearance of the object is sufficient to settle. The most obvious geographical division of the birds of this order certainly corresponds with the usually adopted primary division of the earth's surface. In fact, taking Ornithology as our guide, we may at once pronounce that the Faunæ of the Old and New worlds may, to all appearance, have been the subjects of different acts of creation. There are very many natural families which are quite peculiar to one or the other of these great divisions of the earth's surface, more subfamilies, few genera really common to the two, and very few, if any, species1. The appended Table will show some of the most noticeable of the natural families of birds which are confined to the Old and New worlds respectively. Familiæ Neogeanæ, sive Novi Orbis. Todidæ . . . Momotidæ . . . Bucconidæ . . . Galbulidæ . . . Trochilidæ . . . Icteridæ . . . Cærebidæ . . . Formicariidæ . . . Dendrocolaptidæ . . . Tyrannidæ . . . Cotingidæ . . . Rhamphastidæ . . . Opisthocomidæ . . . Cracidæ . . . Tinamidæ . . . Meleagrinæ . . . Odontophorinæ. Familiæ Palæogeanæ, sive Orbis Veteris. With regard to the genera of Passeres, common to the two worlds, when we have excepted the truly cosmopolitan forms Turdus, Hirundo, Picus, &c., the number will be found very small; and it will be observed that these are invariably genera [[p. 134]] belonging to temperate regions, and such as extend themselves only through the northern portion of the New World, failing entirely before we reach Tropical and Southern America, the most really characteristic region of Neogean Ornithology. Such is the case in the genera Sitta, Certhia, Regulus, Parus, Lanius, Perisoreus, Pica, Corvus and Loxia. No member of these genera (which are common to the temperate portions of both hemispheres) extends farther south in the New World than the Table-land of Mexico. They are all quite foreign to Neotropical (Tropical American) Ornithology, although in the Old World most of them reach the tropics. Having, therefore, made our first territorial division that of the two worlds, agreeing so far with geographers, we will look at the great continent and Australia en masse, and see what are its most natural subdivisions. Here we find ourselves at once at issue with ordinary geographers. Europe may be a very good continent of itself, in many ways, and in some respects worth all the rest of the world put together,--"Better fifty years of Europe than a cycle of Cathay," says the Poet,--but it is certainly not entitled to rank as one of the primary zoological regions of the earth's surface, any more than as one of the physical divisions. Europe and Northern Asia are in fact quite inseparable. So far as we are acquainted with the ornithology of Japan--the eastern extremity of the temperate portion of the great continent, we there find no striking differences from the European Avi-fauna, but rather repetitions of our best-known European birds in slightly altered plumage,--representatives in fact of the European types. Temminck, indeed, has stated, that there are no less than 114 birds found in Japan, identical with European species. Some of these, however, have been since ascertained to be apparently distinct, but there can be no question as to the general strong resemblance of the Japanese Avi-fauna to that of Europe. How far south we are to extend the boundaries of this great temperate region of the Old World can [[p. 135]] hardly be fairly ascertained, until the ornithology of Central Asia is much better worked out than is at present the ease. While among the birds of the Himalayas we find many striking instances of the recurrence of European types, there is no doubt that the ornithology of the Indian Peninsula and the rest of Southern Asia, below the 30th parallel, is quite different from it. Africa, north of the Atlas, along the southern shores of the Mediterranean, again appears to belong to Europe zoologically, and not to the continent to which it is physically joined. Such species of birds, foreign to Europe, as are found in Algeria and Morocco, are not usually connected with true African forms, but are again slightly modified representatives of Europæo-Asiatic species. Such are the N. African species: Garrulus cervicalis, Pica mauritanica, Fringilla spodiogenia, Parus ultramarinus, Picus numidicus. Representatives of the European: Garrulus cristatus, Pica caudata, Fringilla cælebs, Parus cæruleus, Picus major. On the whole, therefore, I think we may consider Africa, north of the Atlas, Europe and Northern Asia, to form one primary zoological division of the earth's surface, for which the name Palæarctic or Northern Palæogean Region would be best applicable. The great continent of Africa will form a second well-marked division, after cutting off the slice north of the Atlas, but including Madagascar (where the African type appears to have reached the height of its peculiar development) and Western Arabia, to the Persian Gulf; for in this latter region, so far as our information goes, the African type seems to predominate over the Indian. Although there are genera of Passeres common to Africa and India, and even a few species, yet there can be no question as to the generally dissimilar character of the Avi-faunæ of these two countries. This second African division may be called the Æthiopian or Western Palæotropical Region. Another tropical region of the Old World seems to be constituted by Southern Asia and the islands of the Indian Archipelago. The Philippines, Borneo, Java, and Sumatra, certainly belong to this division, but it is of course not yet possible to decide where the line runs which divides the Indian zoology from the Australian. New Guinea presents probably only a more exaggerated [[p. 136]] production of the Australian type, and I should be inclined for the present not to separate New Zealand and the Pacific Islands generally from the Australian division. We should have, therefore, in the Old World one temperate region and three tropical; the eastern palæotropical or Australian advancing rather farther to the south than the others, the Indian or middle palæotropical being the most northern of the three. In the New World we can simply divide the continent into northern and southern divisions; the northern, or Nearctic region, extending down the centre of the table-land of Mexico, and showing some indication of parallelism to the Palæarctic by the presence of certain temperate types; the Neotropical or southern (which embraces the whole of the rest of this great continent) being wholly free from any admixture of the sort, and in fact exhibiting, in my opinion (with the exception possibly of New Guinea), by far the richest and most peculiar Avi-fauna of the world's surface. 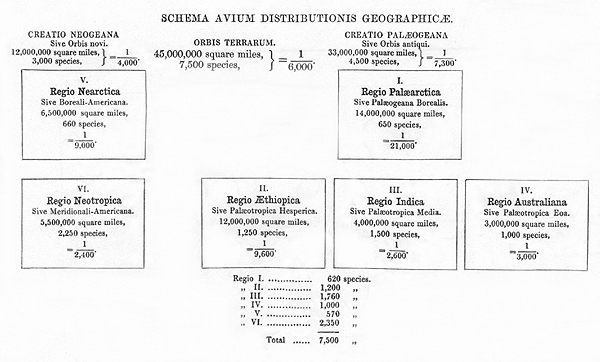 Having thus pointed out what I consider to be the primary divisions of the earth,--taking ornithology as our guide, I propose to devote a few lines to each region separately, noticing its apparent limits, its peculiarities, and most characteristic forms, and attempting to give an approximate estimate of the comparative abundance of ornithic species within its area. The subjoined plan will serve to give at one view an illustration of my ideas as to the arrangement of these primary Avi-faunæ of the earth's surface. It must, however, be recollected that the calculations made as to the number of species to a square mile, can be only looked upon as mere attempts at approximations. Even in the whole general calculation, the presence of two variable elements--in the first place the number of square miles (about which geographers still give the most conflicting statements), and in the second place, the number of species of birds, concerning which ornithologists are as yet by no means agreed, greatly increases the uncertainty of the ratio deducible from them; and in working out the ratios in the respective regions, it is of course still more difficult to attain to any great degree of accuracy. Taking however the whole number of square miles of dry land at 45,000,000, and the number of species of birds at 7500, which are both of them moderate estimates, we have on the average a single species to each 6000 square miles. In the different regions we shall attempt to show how far this ratio is departed from. The zoological kingdoms or primary divisions are of course naturally separable into secondary divisions or provinces, but it would [[p. 137]] be extending the limits of this communication too far to attempt to go into these at the present time. I. Palæarctic Region (Regio Palæarctica). Extent.--Africa north of the Atlas, Europe, Asia Minor, Persia and Asia generally north of the Himalaya range, upper part of the Himalaya range?, northern China, Japan and the Aleutian Islands. Approximate area of 14,000,000 square miles. Characteristic forms.--Sylvia, Luscinia, Erythacus, Accentor, Regulus, Podoces, Fregilus, Garrulus, Emberiza, Coccothraustes, Tetrao. It cannot be denied that the ornithology of the Palæarctic or great temperate region of the Old World is more easily characterized by what it has not than by what it has. There are certainly few among the groups of birds occurring in this Region, which do not develope themselves to a greater extent elsewhere. For we must acknowledge that the most productive seats of animal life, where all the bizarre and extraordinary forms that the Naturalist best loves are met with, lie under the suns of the tropics, and far removed from temperate latitudes. The most prevalent forms among the Passeres, of the Palæarctic Region, are perhaps the plain dull-coloured Sylviinæ, distinguished rather for their melodious song than by any external beauty of plumage or singularity of form. Upwards of 35 species of this subfamily occur in the ornithology of Europe alone; and when Northern Africa and the whole North of Asia are taken into calculation, the number would be considerably increased, and this Region may be considered the true focus of the group. The genus Erythacus would be perhaps as good a representative genus as any as a type of Palæarctic ornithology; a second species (Erythacus akahige) occurring at the eastern extremity of the Asiatic continent, and there beautifully representing our common Robin. True Emberiza is likewise very characteristic of the temperate portion of the Old World, nearly the whole of the known species being found in Europe or Northern Asia. Accentor is perhaps more strictly a northern Himalayan form, with several representatives within the Palæarctic Region; but Fregilus, Podoces, Garrulus, Tetrao, and numerous species of Anatidæ are likewise eminently noticeable as among the most typical forms of Palæarctic ornithology. It is very difficult to say what additions should be made to this in order to give the approximate number of the birds of the whole Palæarctic Region; but a moderate calculation does not show more than 650 species truly belonging to this fauna: for it must be recollected that the number 581 contains many birds of rare occurrence in Europe, and which must be correctly reckoned as belonging to other divisions. As we have in the Palæarctic Region the enormous land area of probably upwards of 14,000,000 square miles, this will give us a species for each 21,000 square miles, speaking in round numbers; and it consequently follows (as might have been expected), that the Palæarctic is by far the least prolific region of ornithic life on the globe. According to my ideas, therefore, the statement in Johnston's 'Physical Atlas,' that "Europe possesses more species than any other zoological province," is exactly contrary to the fact. II. Æthiopian or Western Palæotropical Region (Regio Æthiopica). Extent.--Africa, south of the Atlas range, Madagascar, Bourbon, Mauritius, Socotra and probably Arabia up to the Persian Gulf, south of 30° N. l.; an approximate area of 12,000,000 square miles. Characteristic forms.--Gypogeranus, Helotarsus, Polyboroides, Gypohierax, Melierax, Macrodipteryx, Irrisor, Fregilupus, Bucorvus, Apaloderma, Parisoma, Macronyx, Lioptilus, Sericolius, Malaconotus, Laniarius, Chaunonotus, Prionops, Sigmodus, Phyllastrephus, Lanioturdus, Vidua, Juida, Buphaga, Verreauxia, Læmodon, Indicator, Musophaga, Colius, Pæocephalus, Numida, Phasidus, Struthio, Balæniceps, Scopus. (Madagascar). Euryceros, Falculia, Oriolia, Philipitta, Brachypteracias, Atelornis, Bernieria, Hartlaubius, Artamia, Vanga, Coua, Leptosomus, Vigorsia, Mesites, Biensis. The characteristic forms of African Ornithology are very [[p. 139]] numerous. Several groups of birds, which seem clearly entitled to rank as distinct families, or at least as subfamilies, are wholly peculiar to this region, such as the Coliidæ, Musophagidæ, and Buphaginæ. There are also very many genera, of which the species are all confined to this continent; the principal of which I have enumerated in my List of Typical forms. The island of Madagascar, however, is the locality where the African type seems pushed to its utmost degree of development. There are many genera quite peculiar to this island, or which have a single representative or so upon the adjacent coast of the continent. Such are Oriolia, Atelornis, Brachypteracias, Vanga, and others which I have mentioned above, not to mention the extinct gigantic Æpyornis. Bourbon, Mauritius and the other Mascarene islands all belong to Africa zoologically, and have only recently lost the now extinct birds of the genera Didus, Pezophaps and their allies, which were, so far as we know, types quite peculiar to this locality. In the preface to Dr. Hartlaub's work will be found a resumé of all the most important facts known concerning African Ornithology. A correct catalogue of the Birds of S. Africa would probably be not less numerous in species. [[p. 140]] On the whole, therefore, I think we cannot allow for the Western Palæotropic region less than 1250 species, which, with an area of 12,000,000 square miles, gives one species to each 9600 square miles nearly. III. Indian or Middle Palæotropical Region (Regio Indica). Extent.--India and Asia generally south of Himalayas, Ceylon, Burmah, Malacca and Southern China, Philippines, Borneo, Java, Sumatra and adjacent islands; an area of perhaps 4,000,000 square miles. Characteristic forms.--Harpactes, Colocalia, Calyptomena, Eurylæmus, Buceros, Garrulax, Liothrix, Malacocercus, Pitta, Timalia, Pycnonotus, Phyllornis, Pericrocotus, Analcipus, Acridotheres, Gracula, Sasia, Megalæma, Phnicophaus, Dasylophus, Palæornis, Pavo, Ceriornis, Polyplectron, Argus, Euplocamus, Rollulus, Casuarius. Mr. Swainson, in his article in H. Murray's 'Encyclopedia of Geography,' considers the mainland of Southern Asia and the larger Indian islands as belonging to two different zoological regions. But it is now generally acknowledged that this is not the case. There are so many generic forms which commence in Southern Asia and extend over the greater part of the Indian Archipelago, that it is not possible to look upon these countries as belonging to different regions, though they doubtless form distinct subkingdoms or provinces, in each of which will be found corresponding representative species. How far in an eastern direction we are to extend the boundaries of the Middle Palæotropical Region is a difficult question, which can hardly be answered until we know more of the Natural History of these great islands; but there is no doubt that Borneo, Sumatra and Java belong to this zoology, but probably not Celebes. The most characteristic forms of the Indian region are without doubt the Phasianidæ, the whole of which magnificent group of birds may be said to be confined to this region,--one or two species only straying into the confines of Palæarctic zoology, and a single genus, Meleagris, representing them in America, and the few birds of the genera Numida, Agelastus and Phasidus in Africa. If the number of species duly attributable to the Middle [[p. 141]] Palæotropical Region, be reckoned at about 1500, and its geographical area at nearly 4,000,000 square miles, we have a species to each 2600 miles nearly, which indicates a degree of intensity of species only surpassed by Tropical America. IV. Australian or Western Palæotropical Region (Regio Australiana). Extent.--Papua and adjacent islands, Australia, Tasmania and Pacific Islands; an area of perhaps 3,000,000 square miles. 1. (Australia.) Ægotheles, Falcunculus, Colluricincla, Grallina, Gymnorhina, Strepera, Cinclosoma, Menura, Psophodes, Malurus, Sericornis, Epthianura, Pardalotus, Chlamydera, Ptilonorhynchus, Struthidea, Licmetis, Calyptorhynchus, Platycercus, Euphema, Calopsitta, Climacteris, Scythrops, Myzantha, Talegalla, Leipoa, Pedionomus, Dromaius, Cladorhynchus, Tribonyx, Cereopsis, Anseranas, Biziura. 2. (Papua.) Sericulus, Melanopyrrhus, Ptiladela, Edoliosoma, Peltops, Rectes, Manucodia, Gymnocorvus, Astrapia, Paradisea, Epimachus, Nasiterna, Charmosyna, Cyclopsitta, Goura, &c.
3. (New Zealand.) Neomorpha, Prosthemadera, Anthornis, Acanthisitta, Mohoa, Certhiparus, Turnagra, Aplonis, Creadion, Nestor, Strigops, Apteryx, Ocydromus. 4. (Pacific Islands.) Moho, Hemignathus, Drepanis, Pomarea, Metabolus, Sturnoides, Leptornis, Tatare, Loxops, Coriphilus, Ptilonopus. The most characteristic forms of this region are perhaps the Paradiseidæ and Epimachidæ (both peculiar to it), the Meliphagidæ, one or two genera only of which are found externally, and of which between 60 and 70 species occur in Australia alone; the genera Calyptorhynchus, Microglossa, Trichoglossus, Platycercus, Nestor, Strigops, and many other forms amongst the Psittacidæ, besides a vast number of others. Taking 3,000,000 of square miles as the amount of dry land in this region, and allowing 1000 species as peculiar to it, we have one species to every 3000 square miles, showing us that this is little inferior to the middle Palæotropical Region in intensity of species. V. Nearctic or North-American Region (Regio Nearctica). Extent.--Greenland and North America down to centre of Mexico--area of perhaps 6,500,000 square miles. Characteristic forms.--Trochilus, Sialia, Toxostoma, Icteria, Vireo, Mniotiltinæ, Chamæa, Certhia, Sitta, Neocorys, Calamospiza, Zonotrichia, Picicorvus, Gymnocitta, Meleagris. As is the case in the Old World, most of the genera belonging to the northern part of the New World are better represented in its tropical than in its temperate portions. Northern America, however, produces Sylvicolæ and Zonotrichiæ in much greater abundance than southern America, and these genera (which are analogous to the Sylviinæ and Emberizæ of the Old World) are perhaps its most ordinary characteristic forms. I have already [[p. 143]] mentioned the chief genera common to the northern portions of both hemispheres. These are also characteristic of Nearctic in contrast to Neotropical zoology, as none of them extend into Southern America. The ornithology of the U. S. of America (which now embrace a very large proportion of the Nearctic region) contains upwards of 620 species. Calculating the area of the Nearctic Region at six millions and a half of square miles, and the species peculiar to it at 660, we have about 9000 miles for each species, making this region, as might have been supposed, the least productive of ornithic life, after the Palæarctic. VI. Neotropical or South-American Region (Regio Neotropica). Extent.--West India Islands, Southern Mexico, Central America and whole of S. America, Galapagos Islands, Falkland Islands. Estimated area of about 5,500,000 square miles. Characteristic forms.--l. (Continental.) Sarcorhamphus, Ibycter, Milvago, Thrasaëtus, Cymindis, Herpetotheres, Steatornis, Nyctibius, Hydropsalis, Eleothreptus, Trogon, Bucco, Monasa, Galbula, Furnarius, Synallaxis, Anabates, Oxyrhamphus, Dendrocolaptes, Pteroptochos, Rhamphocnus, Campylorhynchus, Hylophilus, Lessonia, Agriornis, Formicarius, Formicivora, Grallaria, Tænioptera, Tityra, Conopophaga, Pipra, Rupicola, Phnicercus, Cotinga, Gymnoderus, Cephalopterous, Vireolanius, Cyclorhis, Thamnophilus, Tanagra, Calliste, Saltator, Euphonia, Catamblyrhynchus, Phytotoma, Opisthocomus, Ramphastos, Picumnus, Celeus, Crotophaga, Cultrides, Penelope, Oreophasis, Crax, Thinocorus, Tinamus, Psophia, Cariama, Eurypyga, Parra, Palamedea, Chauna, Aramus, Merganetta, Heliornis. 2. (Antilles.) Todus, Priotelus, Cinclocerthia, Dulus, Loxigilla, Phnicophilus, Spindalis, Glossiptila, Teretristis, Saurothera. 3. (Galapagos.) Certhidea, Cactornis, Camarhynchus, Geospiza. There can be no question, I think, that South America is the most peculiar of all the primary regions in the globe as to its ornithology. There are at least eight or nine distinct families of birds which are quite confined to this country, many of these embracing a multitude of different genera and species. The Trochilidæ (which are the distinguishing family of the new world par emphase) are now known to be more than 320 in number, and [[p. 144]] nearly the whole of them belong to tropical America, a few species only ranging into the northern portions of that continent. It is of course quite impossible to ascertain exactly the boundary between the northern and southern zoological regions of the New World; but many of the peculiar forms of the southern division appear to extend some way up the coast-line of Southern Mexico, even north of the isthmus of Tehuantepec; whilst northern forms range down the table-land quite into the Southern States of the Mexican Union. Thus we find one or two representatives of all the most characteristic South American groups occurring to the north of Panama,--Galbula melanogenia representing the Galbulidæ; Pipra mentalis and Manacus Candæi, the Piprinæ; Calliste larvata, the genus Calliste; Cotinga amabilis, the Cotingæ, and so on. The Antilles seem to be a kind of debateable ground between the two regions, but are more properly referable, I suppose, or at least the greater portion of them, to the southern region. They furnish us, however, with several peculiar genera which do not occur elsewhere. and I am decidedly of opinion that, what with taking recent additions into consideration and adding on Central America, we cannot estimate the number of birds belonging to this region at less than 2250. Taking the approximate area at 5 ½ millions of square miles, this will give a species to each 2400 square miles. It follows, therefore, that this region is more richly endowed with ornithic species than any other portion of the globe.